Get barcodes for all of your print books and make them easier to sell! To Buy Barcodes - Click Here! Having a barcode on your book will facilitate automated sales and inventory tracking - a requirement for most large retailers. When you get your barcodes from Bowker, the only official US ISBN Agency, you can be sure they meet the latest book publishing industry requirements. On My Identifiers, you may only generate a barcode for an ISBN assigned to you or your organization as the publisher by the US ISBN Agency (Bowker). If you don't meet these requirements, you may go to BowkerBarcode.com to obtain a barcode. A barcode is not an ISBN. It's a graphical representation of your book's ISBN and price. 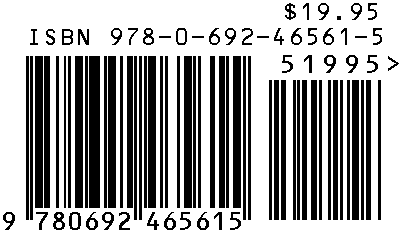 To use a barcode, you'll need your book's ISBN and pricing information. You can purchase and download a barcode after you've created an account at MyIdentifiers.com. You can store your barcodes for future use at MyIdentifiers.com. Please make sure you enter the correct price on the barcode. Once the barcode is generated the price cannot be changed. Need More Than 10 Barcodes? Add 11 barcodes to the cart, then adjust your quantity if you need more. Buying 6 Barcodes decreases the cost for all 6 barcodes, not just the 6th barcode. ISBNs are prerequisite for Barcodes.